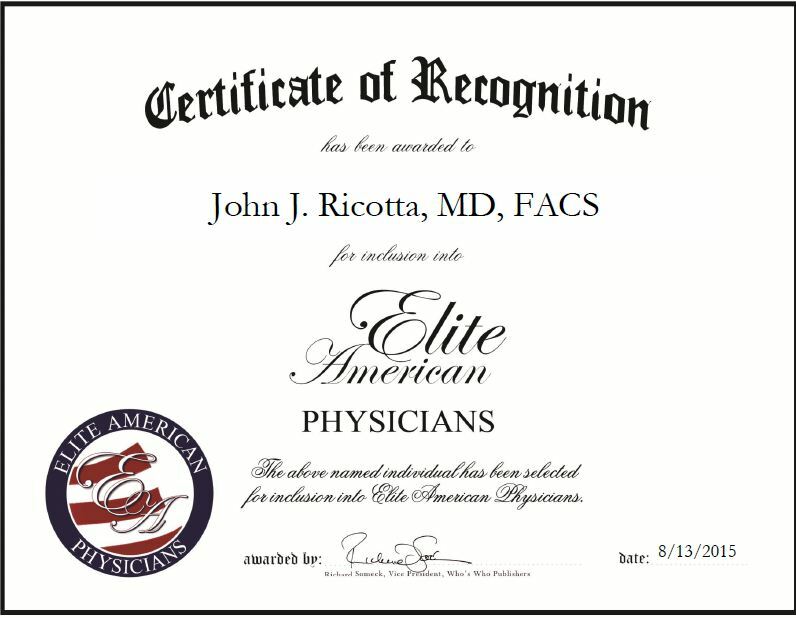 Washington, DC, August 13, 2015, John J. Ricotta, MD, FACS, Doctor of Medicine at Washington Hospital Center, has been recognized by Elite American Physicians, for dedication, achievement and leadership in vascular care. Dr. Ricotta brings 34 years of experience to his role as a Doctor of Medicine at Washington Hospital Center. Throughout his career, he has set himself apart through his work in the treatment of aortic aneurysms, carotid artery disease and strokes, peripheral vascular disease, varicose veins, venous insufficiency, venous thrombosis, venous compressive syndromes, thoracic outlet compression and Raynaud’s disease. During his impressive tenure as a vascular surgeon, Dr. Ricotta served as chairman of surgery at Stony Brook University Hospital in New York, and most recently, he was chair of surgery at Washington Hospital Center and director of the regional vascular program for MedStar in the Capitol area. Dr. Ricotta has stepped away from his administrative roles to devote his professional time to individualized patient care at Capitol Vascular Care, but he maintains privileges at both Washington Hospital Center and Georgetown University Hospital. Dr. Ricotta has authored more than 250 articles and book chapters in all areas of vascular disease and has lectured all over the world on all aspects of vascular care. This entry was posted in Vascular Care and tagged aortic aneurysms, carotid artery disease, lecturer, peripheral vascular diseas, strokes, surgeon. Bookmark the permalink.